President Obama traveled to Iowa Tuesday and touted wind energy subsidies as the path to economic recovery. Then he attacked Mitt Romney as a tool of the oil and gas industry. "So my attitude is let's stop giving taxpayer subsidies to oil companies that don't need them, and let's invest in clean energy that will put people back to work right here in Iowa," he said. "That's a choice in this election." There certainly is a subsidy choice in the election, but the facts are a lot different than Mr. Obama portrays them. What he isn't telling voters is how many tax dollars his Administration has already steered to wind and solar power, and how much more subsidized they are than other forms of electricity generation. The facts come in a 2011 report from Mr. Obama's own Department of Energy. The report—"Direct Federal Financial Interventions and Subsidies in Energy in Fiscal Year 2010"—identifies $37.16 billion in federal subsidies. These include special tax breaks, loans and loan guarantees, research and development, home heating assistance, conservation programs, and so on. The nearby chart shows the assistance that each form of energy for electricity production received in 2010. The natural gas and oil industry received $2.8 billion in total subsidies, not the $4 billion Mr. Obama claims on the campaign trail, and $654 million for electric power. The biggest winner was wind, with $5 billion. Between 2007 and 2010, total energy subsidies rose 108%, but solar's subsidies increased six-fold and wind's were up 10-fold. The best way to compare subsidy levels is by the amount of energy produced. But the Energy report conspicuously left out this analysis, though Congress specifically requested it. Energy said that "caution" should be used in calculating the taxpayer handouts "relative to their share of total electricity generation," because many wind and solar subsidies are for "facilities that are still under construction." It also warned that "Focusing on a single year's data does not capture the imbedded effects of subsidies that may have occurred over many years" for other energy sources. This sounds suspiciously like a political dodge, because subsidies for renewable energy date to at least the 1970s. The problem is that wind and solar still can't make a go of it without subsidies. Solyndra is merely the most famous of the solar-power failures. Earlier this month United Technologies sold its more than $300 million investment in wind power, with CFO Greg Hayes telling investors, according to press reports that: "We all make mistakes." He added that the market for renewables like wind "as everyone knows, is stagnating." Someone alert the White House. So for every tax dollar that goes to coal, oil and natural gas, wind gets $88 and solar $1,212. After all the hype and dollars, in 2010 wind and solar combined for 2.3% of electric generation—2.3% for wind and 0% and a rounding error for solar. Renewables contributed 10.3% overall, though 6.2% is hydro. Some "investment." By the way, these subsidy comparisons don't consider that the coal, oil, and natural gas industries paid more than $10 billion of taxes in 2009. 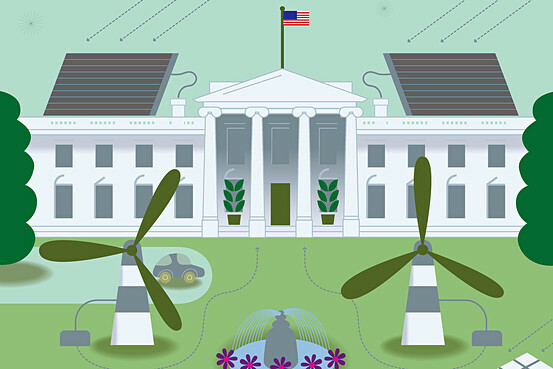 Wind and solar are net drains on the Treasury. Mr. Obama's plan to eliminate oil and gas subsidies would lower the budget deficit by less than $3 billion a year, but creating a true level playing field in energy, and allowing markets to determine which energy sources are used, would save $37 billion. That's an energy plan that makes sense.